– The Nopal cactus, prickly pear, or Indian fig (Opuntia ficus-indica) is a plant of the cactus family native to Mexico. – Currently, this plant is naturalized in many parts of the world, especially across America (from Canada to Chile), in the Mediterranean region, North Africa and Australia. 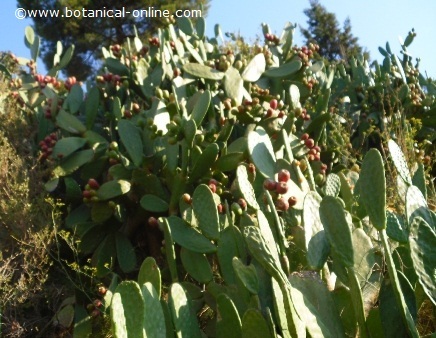 – Prickly pear plant is between 3 and 6m tall. It forms large clumps. – Stems are succulent, ellipsoidal, overlapping and green. They are called cladodes. They measure 30 to 60cm. long by 20 – 40cm. wide and 2 – 3cm. thick. – Commonly, the cladodes are called pads. Its interior is gelatinous, and contain mostly water and nutrients. They are very thick to prevent water loss. – In adult plants, the leaves of the base can become woody and brownish in color, with a thickness of between 20 – 50cm. in diameter. – The plant has no leaves, but thorns. Unlike other cacti, cactus has very few or no spines. These are long (2cm.) and appear in clusters, covered with a fuzz of tiny spines called glochidia. – In the cladodes or pads are the areolas, from where new shoots or flowers develop. – Flowers are showy, solitary, sessile, hermaphrodite. In the incipient fruit, They can have different colors: yellow, orange, red or white. – Normally flowers grow in the upper margins of the leaves. – The fruit is an ovoid berry, and it may have different colors: yellow, red, purple or green. – The flesh of the fruit is sweet, gelatinous and greenish, bearing numerous seeds in it. – Prickly pear is a long-lived cactus that can live up to 80 years. – We eat its fruits, known as prickly pears or tuna, and also its sticks called nopales. The last ones are used as vegetables. – The pear fig tree is a natural resource to protect the soil from wind erosion and desertification, especially in the more arid regions of the planet, with long periods of drought. – Tropical and subtropical climates. – Xerophytic plant, living in arid and semi-arid zones. – It can grow in desert areas and withstand long periods of drought. Resistant to heat and drought, it develops optimally at temperatures from 18 to 30 º C and can withstand temperatures up to 50 º C.
– Locate the plant in full sun. – Altitude 0 to 700m. above the sea level. Native to coastal areas. – Sensitive to freezing temperatures that cause tissue damage and affect the production of fruits, but it may recover. – Some varieties can grow at temperatures below zero (-15 º C). In this case, we plant it near walls or fences that protect them from the cold sea winds and north winds. – The optimal annual rainfall for the crop is located on the 500-600mm. However, Prickly pear can grow in very arid soils, with annual rainfall of up to 116mm. Rainfall higher than 1000mm. limits the growth of the crop. – Deep and well drained soils. – It prefers sandy and calcareous soil texture, but it is able to adapt to all types of terrain. – Soil pH between 6.1 and 7.8. This cactus may be reproduced vegetatively or by seed. One shoul use the vegetative form, since it is a simpler process. In the picture: Prickly pear illustrations, where we can distinguish the different parts of the plant. – You get a plant identical to the parent plant. – Looking at the cactus, we can see that the leaves are able to produce new shoots (cactus) or flowers from a bud or areola. – The areolas are meristematic tissues (tissues of plant growth) capable of producing new shoots ofrom the plant. That is, cactus or young fronds, flowers or fruits are capable of developing a new plant. – After harvest, a well-developed young cladode is selected. Take the ones between 1-3 years old and medium-large. We should note them to be healthy, undamaged, free from specks or deformations. – With the help of a clean and sharp knife cut the stalk from its attachment point, trying to make a cut as small as possible to prevent infection. – Place the leaves in a shady place for 10 days or two weeks in a sand substrate, until the cut has healed. – Transplant at the final place in late spring, when there is no risk of frost and the rainy season is over. It is recommended to have made two months before work removed and fertilized soil. -Half or two thirds of the pad must be buried on the floor, cut side down and pressing the terrain. If buried less than half of the pad, the wind may lie it down or too shallow roots may develop. If we bury more than two thirds of the palette, we are limiting their growth and regrowth, since it will have little surface for photosynthesis. – Prickly pear blooms in spring and produce fruits in summer. – Depending on the climate, it can have two blooms a year, once in spring and one again in late fall. – Generally, it bears fruit within two or three years after being planted, and reaches its highest production at seven or eight years old. – Generally, the prickly pear harvest is done in late summer. – The fig pear harvest is performed manually, separating the fruit from the stalk with a slight twist. – Due to its thorny nature, we must protect our hands with gloves. For the collection, we can also use a clean sharp knife. – The time of harvest is known by the color of the fruits (different depending on variety) and the disappearance of the depth of the floral receptacle. 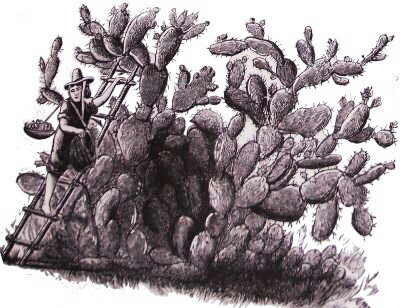 – On a commercial level, after harvest, the fruits undergo a process known as “prickly pear desahuatado”, consisting on the removal of stones and thorns. A manual or industrial process, which is performed with brushes rotating in opposite directions to pull the prongs of the fruit skin. – At home, the larger spines must be removed, the fruit peeled and rinsed. The prickly pears have tiny spines that are very difficult to remove, so the skin is not eaten. – Commercial fruits undergo a drying process and brightness for packaging. Subsequently, they are selected and classified according to its quality and in some cases, waxing. The packaging is done in wood or plastic baskets and labeled. – In general, nopal cultivation requires minimal care. Basically, the requirements involve having regular pruning, fruit thinning and girdling(ring-barking). – Excessive irrigation: It is one of the factors that reduce crop productivity. Also, if the annual rainfall is high, it does not allow the development of the plant and makes it more susceptible to fungal diseases and insect attacks. – Lack of soil nutrients: although it is a plant adapted to extreme conditions, the Prickly pear requires rich soil to thrive and produce new shoots. It prefers calcareous and rocky soils. – Protect from frost: We must protect our cactus from frost, as it may cause damage and undermine the whole plant fruit production. – Pruning is important in the management of prickly pear: It is done in order to provide this plant a good shape, to improve fruit quality, to improve pest control and for easier harvesting. – Always use a clean and sharp knife, and the cut should be the smallest possible diameter. It is better to do it spring, away from rain and frost. – The leaves that are very close to each other. – The leaves that have defects, malformations, spots, etc..
– The leaves arranged horizontally. – Excessive outbreaks limits sun time expose of the leaf stem. Seek to eliminate excess of shoots, leaving at most 2 buds per stalk. – Remove some old stalks that produced fruit last year to stimulate fruiting. It is recommended that the height does not exceed 1.5 m. to facilitate harvest. – Fruit thinning is done to get better quality crop. It is aimed to remove a certain amount of flowers to achieve lower production but better quality (size, etc..). For example, each stalk can submit up to 25 flowers. Even if they come to fruition, they will likely be reduced in size. – Thinning is recommended two weeks prior to the formation of the fruit, leaving approximately up to 10 fruits per stalk. – Mealybugs (Dactylopius spp. ): It is a cactus insect host. Many plantations of prickly pear are intended for the production of cochineal, as it produces a highly prized natural dye, used in the food, pharmaceutical and cosmetic industry. It is characterized by a cottony appearance, which when crushed has a reddish color. This pest can cause premature fruit drop. – Rust: characterized by pustules round yellow-orange fruits and pallets, which dries leaving a hole in the leaf. – Root rot: fungus disease, which destroys the root system of the cactus. Generally it can be produced by excess of irrigation or high soil moisture. It is observed from the leaves wilt. Caused by Armillaria amellea or Fusarium spp. – Soft rot: caused by Erwinia spp. Symptoms begin in the apical region of the leaves, and spread throughout. Plant tissues become soft and watery, and discoloration of the leaves appears. Usually caused by excessive moisture. – Thickening of cladodes: A disease caused by a virus, which is produced in Mexico. The plant gradually loses its green color. We should remove the leaves damaged and sanitize the pruning utensils. – The main producers of prickly pears are: Mexico, Colombia, Israel, South Africa, Chile, Italy and Spain. – Countries that import the fruit are: Germany, France, Holland, England, USA and Japan. More information about prickly pear.